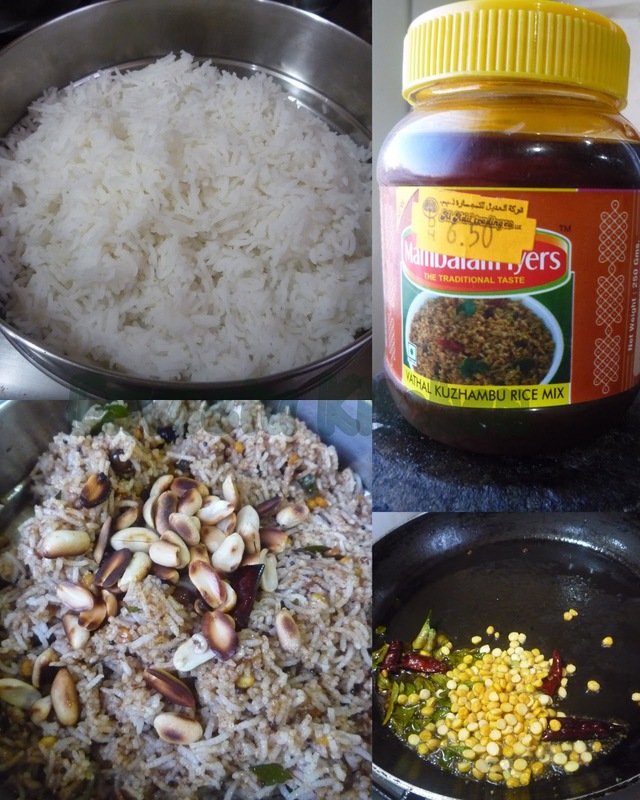 Day 2 of Blogging Marathon, today i m posting Lunch ideas using Ready Mix. I have cooked 2 Food Options, first one is Kalandha Saadam or Mixed Rice using a Ready-made Vathakuzhambhu Thokku/Paste. Second one is Readymade Meal Mix - Sambar Mix. Heat oil in a Non-stick pan, Splutter mustard seeds. Add chana Dal and Chillies and Curry leaves. Add vanthakuzambhu Thokku/Paste to Rice and mix well. Garnish with Roasted Peanuts and Serve Hot with Crisps or Potato Curry. Heat a oil in a Pan. Splutter mustard seeds, add methi seeds and chillie. When methi seeds change color, add chopped onion and saute. Add Tomato and Saute for sometime. Next add the cubed Potatoes and add Water. When the water starts boiling and the potatoes are Half-Cooked, add Sambhar Meal Mix and Mix well. Put of the Stove and Serve hot with Rice or as a Condiment with Hot fluffy Idlies or Crispy Dosa's. 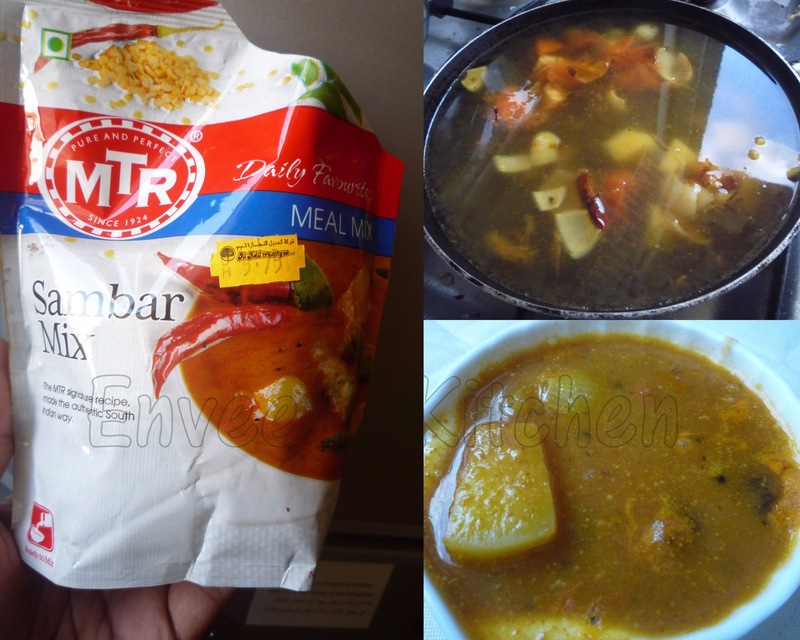 I Liked the Mixed Rice better than the ReadyMeal Mix- Sambar. The Sambar had a Mild Sweet taste. It tasted good with Thayir Saadam/Curd Rice. I might prefer them as a Condiment with my Breakfast than with Rice. Wish i live next to u, droolwothy vathakuzhambu and sambhar, i planned to get vathakuzhambu mix from India,but unfortunately coz of excess kgs i couldnt bought them, mouthwatering here..
vathakuzhambu sadam is looking great. You have used which brand Priya and from where u got this? delicious vathakulambu satham with vadam yum,..., readymix sambhar picture is inviting. I love vatha kuzhambu :) My mom always keeps ready in the evening when we are back from school,its divine! Such a filling and comforting dishes. Love the convenience of ready mixes. I am still getting familiar with these different South Indian names....of dishes...I am restricted to idli dosa sambar..n of course rasam!! A fabulous and very tempting saatham! Nice one .. good to know about the mixes. Very delicious one priya..very convienent right.. The vathakuzhambu looks really good. Is the first one kind of puliyoagare mix? I too find MTR sambhar not one of my liking. It is too cinnamony.